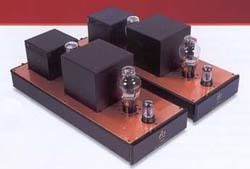 My July 2001 review of Audio Note’s AN-E/D speakers was the first of three AN hardware reviews, followed by this review on a pair of AN’s own single-ended, directly heated, no feedback triode monoblocks, the Quest, and an upcoming one on the M3 pre-amp. Since the AN-E/D review elaborated on how the speaker performed with the Quest, this review will cover how the Klipschorn sounded with the Quest. We shall also take this opportunity to examine Audio Note’s sophisticated R&D principles. Upgrade of Quest’s 300B tubes from the Chinese stock to Western Electric’s costs $500 for the pair. A $4,000 “Silver” upgrade adds proprietary tantalum resistors, copper foil signal capacitors, Black Gate electrolytic capacitors and High B copper wired C-core output transformers. “Silver Signature” upgrade of the Quest’s utilizes more Black Gate’s, with Audio Note silver wiring and copper wired thin lamination Radiometal 36 C-core transformers, for another $5,600. To Peter Qvortrup, directly heated triodes are the perfect and original voltage amplifier for High-End audio application, because its amplification pattern is highly linear, whereas solid-state devices’ “semi-conducting” nature along with the resultant largely non-linear amplification patterns makes them unsuitable. The tradeoffs for using tubes are higher maintenance cost and lower power. Audio Note has set performance parameters for its products in the goal of attainment of specific fidelity, they are: low level detail, dynamic contrast, bass control with pressure expansion, intensity of piano attack, timbral separation between instruments, general presence, immediacy and presentation. Other specifics, such as imaging and soundstaging are considered secondary as AN believes that certain frequencies must be emphasized in creating convincing soundstages, thus sacrificing timbral accuracy. AN’s website (www.audionote.uk.com) contains four essays detailing the core values and beliefs that guide the company in its R&D and marketing efforts. The central guiding principle, called “Comparison By Contrast,” is illustrated in the article “Are You On The Road To Audio Hell.” Authored by Peter Qvortrup, the article first appeared in Positive Feedback Magazine, from the December 1993 issue to February 1994, and was later revised into the current edition by Leonard Norwitz, an avid music lover and AN’s former U.S. distributor who remains a close friend of Peter’s. In the article, Peter maintained that despite recording engineers’ earnest efforts, reference monitoring systems used in sessions were personal standards of the engineers at their best. Events that had transpired in the studio could never be recreated. By the same token, if we build our systems to aspire to certain sonic excellence, be it lifelike dynamics or tonal accuracy, we are in the mindset of “comparison by reference” – restricting the ability of expression in favor of our preferences. According to Peter, his systems would give great recordings their full glories, without masking inferiority of poorer recordings. It is Peter’s opinion that when recording engineers began mastering digitally, standards had then been imposed to make all materials conform to certain sonic parameters, resulting in large degrees of homogeneity among each other. To him, digitally mastered vinyl suffers from the same fate. This homogeneity is inferior because forced conformity to a desired performance parameter on all recordings means imposing sonic signatures and coloration, rendering a system less accurate. It leads to boredom, resulting in our continuing dissatisfactions at our hobby. Therefore, Peter considers pre-digital vinyl in their entirely analog nature as superior. Judging from the many positive opinions on the sound of vinyl, I’d say Peter analyzed the digital phenomena expertly, albeit a personal version of it. “Comparison By Contrast” assures ongoing revelations from our music collection, as equipment designed with this concept will not make your music sound better; but will reveal differences in each recording – the contrast; thereby assuring reinvigorating experience continuously. Assuming one’s goal is always to extract the most out of the source, it becomes imperative that downstream equipment be as impartial and transparent as possible. If so, then the $35,000 M8 pre-amplifier and $95,000 Gaku-On monoblock power amplifiers do not produce the best sound in terms of ultimate smoothness and musicality; but they supposedly amplify without a signature sound. Last not least, AN believes that strategic and progressive applications of silver and premium parts into it’s products determine the level of fidelity. From AN’s “July 2000” News article (www.audionote.co.uk/), we are told that the application of silver to equipment must be done strategically, because carelessly silver-wiring parts of a machine will only expose limitations of remaining non-silver components. Silver lacing an entire device will certainly bring about a wholesale improvement but will also skyrocket the cost. To this end, AN instituted a “Performance Level System” that grades equipment of the same caliber together to ensure compatibility, as vastly superior equipment with increased premium parts usage will expose weaknesses from lesser equipment up and downstream of it. Nine levels in total, customers are encouraged to assemble a system by choosing equipment from within two levels of each other to complement each other’s quality of materials and parts. This is said to maximize the price to performance ratio. Matching equipment that are 3 levels or more from one another will actually deteriorate the sound, as limitations from the lower level unit will be exposed. AN believes a system assembled per “PLS” will ensure customer satisfaction in terms of investment value and musical enjoyment. The Quest couldn’t drive the 6ohms 90dB Genesis VI using its 6ohm tab. Dynamic contrasts were virtually non-existent. This ruled out the less efficient Celestion SL700 and the Apogee Duetta Signature, leaving only AN’s own AN-E/D and my Klipschorn as possible candidates. This review’s primary focus will be on the Quest driving the K-horn. For readers who are interested in the details of the Quest driving the AN-E/D speakers, please refer to the above link. The original Chinese 300B tube that came with the Quest nevertheless possessed excellent instrumental texture rendition, with spatial definition on the same par as the W.E. However, the Chinese tubes could not approach W.E.’s ultimate low-level resolution prowess. In addition, the Chinese tubes produced louder microphonic ringing. I therefore carried on the audition with the W.E. 300B’s. Krell’s KRC-2 preamp was disqualified as noise was accentuated with the Quest driving either the Klipschorn or AN’s own AN-E/D. AN’s matching “Level 3” preamp M3 was still being arranged for review, so my Wadia 27 Decoding Computer with its adjustable internal output level became the only fitting candidate and was used throughout this review. The Wadia-driven K-horns produced noise audible only within five feet even at full idling volume. The noise was even lower when driving the AN-E/D. The very high-output nature of the 27 was initially problematic. Internally set to the lowest output, the Wadia nonetheless became too loud even at 50% of full volume. Although the 27 outputs the highest resolution of 22-bit when set to 75% of full volume or above, the user’s manual does guarantee a 20-bit resolution even at very low volume. AN’s own AN-V Symmetrical 99.99% silver interconnects were initially run from Wadia 27 to the Quest. After extended listening, I put the Granite Audio #470 slow-drawn single-crystal silver interconnect back into the system later on. Speaker cables were the 8-foot bi-wired Audio Note AN-La Large Crystal Pure Copper Litz Screened when driving the AN-E/D, and Cardas 5C single-wired when driving the K-horn. Tube amplifiers’ exhibit audibly louder white level noise than their solid-state counterparts during idling. This inherent disadvantage on the Quest was magnified when driving very high efficiency speakers, like my 104dB Klipschorn. This level of noise from the Quest was lowered when it was changed from driving my 104dB Klipschorn to Audio Note’s own AN-E/D speakers with 94dB sensitivity at 8 ohms. Yet lower noise levels were obtained when the Quest was driving the 90dB Genesis VI, but dynamic transients were compromised when handling the less efficient Genesis. Suspecting other appliances in the household were culprits contributing to the remaining noise, I hired an electrician to run two pairs of power lines directly from my fuse box to the front wall of my listening room, ensuring flow of isolated power. From there, four Hubbell Hospital Grade outlets were terminated out of each power line, sending 20amperes of undisturbed electricity to each outlet. The rewiring process cost $450 and took a total of 6 working hours as the electrician had to crawl under my house. Drawing power from the new outlets finally subdued the white noise from my Klipschorns to become only audible within five feet. I was enlightened by the advantages of dedicated power lines. The singular musicality of the Quest driving its own AN-E/D speakers, as reported in my other review, demonstrated the synergy of the combination. Driving the Klipschorn revealed interesting aspects as well. Before they were broken-in, the W.E 300B Quest’s soundstage extended widely between my Klipschorns but not beyond them. Images on stage were solid and stable; but instrumental textures were not as refined as I had hoped. Bass was relatively soft. Even then, the Quests were stellar at differentiating tonal complexities from fore- and background instruments, rendering a sound more delicate than from all amplifiers I have used to date. Coupled with the lifelike dynamics of the Klipschorn, this distinction in timbre rendition alone was temptation enough to disregard all established personal standards in favor of the Quest’s. After the recommended 300 hours of burn-in, dynamic contrasts intensified, bass became more taut and soundstaging was stretched to the outer edges of the left and right speakers. In rendering the Mahler No. 8, the Quest-driven K-horn’s tonality improved, as instruments were better differentiated from each other and dynamics became effortless. A relaxed urgency from the Quest represented a stark contrast to the K-horn in the company of Monarchy Audio’s SM70s. Although K-horn’s human voices during more serene passages did not compare to the tranquility of the AN-E/D, the very credible soundstage size as accorded by the K-horns made it equally enjoyable. Piano playing, as in Rachmaninoff’s Rhapsody on a Theme of Paganini, carried a renewed thoughtfulness as induced by the Quest, complimenting the momentary bursts of fortissimo in convincing dynamics. Again, the tradeoff in the K-horn is the tonality of the piano, not having the same supremely rendered harmonic content as the AN-E/D. From the first note in Richard Strauss’ Also Sprach Zarathustra, precision playing of instrument groups from the virtuosos of Berlin Philharmonic under Maestro von Karajan became more discernible from the Quest, in their near-perfect unity of tonalities and dynamics. All this lead to the anticipated emergence of the superhuman in the demonstration-quality full-force eruption of the orchestra. It is always an incomparable experience from the K-horn when this passage is played. The K-horn and MA’s SM70’s rocked my house to pieces with Metallica’s daunting dynamics; this dynamic potency was also largely intact with the Quest. Nevertheless, it was during the solo playing of electric guitars that the K-horn showed the level of realness a good tube amplifier could help it attain. However, to devotees of punchy heavy metal music, the Quest may not be dynamic enough. The most intoxicating music ever to come from the Quest-driven K-horn was the trumpet playing of Tiger Okoshi of JVC. Horn playing horn makes sense; but with a 300B tube amp brewing it through a 104dB efficiency horn speaker – amidst milder dynamics – I reckon such presentation will create many converts of both horn and tube. Dynamics were again slightly more truncated than when the Monarchy Audio SM70’s were driving the K-horns; but the realness of instruments and dimensionality of Quest were unmatched. If parts quality is indicative of the level of neutrality, and the product with the most premium parts represents a supreme example of Audio Note’s philosophy, then the $95,000 Gaku-On is the ultimate embodiment of that philosophy. Almost 24 times the price of the Quest, one can reasonably expect a steep diminished rate of return on improvements when progressing from the Quest upward to the Gaku-On. Since the Quest’s is priced in a more competitive range, we can also reasonably expect it to largely represent what the company has to offer. As noted in my AN-E/D review, beautiful and memorable music was produced when the Quest’s were driving the 94dB 2-way AN-E/D with the Wadia 27 as a pre-amp. The monoblocks excelled at depicting instrument tonality, a trait more readily recognized when driving the AN-E/D. The success of the synergy is evident, as the AN system played loud without strain, conveying ample instrument tonalities as described in my AN-E/D review. The sound of the K-horns driven by the Quests reminded me of Tannoy’s Churchill, as renewed subtlety and finesses flowed from the K-horns. Transformation may be too dramatic a word to describe changes brought about by the AN monoblocks; but the Quest bestowed delicacy and nobility upon the K-horns. The AN-E/D was less dynamic than the K-horns but more detailed in tonality rendition. K-horn admirers may find fault with the AN-E/D’s wide-dispersion pattern and lesser dynamic capabilities; and AN-E/D users may yet find K-horn’s tonal accuracy wanting. While Audio Note recommends pairing the Quest monoblocks to speakers with sensitivity of 89dB or higher, I would caution against driving speakers with less than 90dB efficiency, especially if they have more than two driver units. The Quest’s couldn’t drive my 90dB sensitivity 6ohm impedance Genesis VI, which has two tweeters, one 5inch midrange and one 5inch mid-bass. A dedicated servo amplifier powers the three 10-inch subwoofers separately. Caution in pre-amp selection is also required when matching the Quest to very efficient speakers. The pre-amp used must be extremely low in noise, otherwise loud idling noise will result. I was surprised that even my Krell KRC-2 didn’t fare well in the coupling in terms of noise. Upgrading the Quest to the C-core transformer equipped “Silver” version should at least extend the top and bottom-end definition, a trait I noted most prevalent on the C-core GW Labs 270 tube amplifier that I previously reviewed. At $4,000, the pair of Quest monoblocks is a competitive and noted contender for tube aficionados who are seriously considering worthy companions for their highly efficient speakers. Borrowing words from food critiques, the Quest is sweet without masking the palate of accompanying subtleties. Regarding Audio Note’s beliefs and philosophies, the company goes to great lengths in the iteration of those philosophies to a greater extent than most companies ever have. The ideology and driving desire for music reproduction at its purest are undoubtedly nicely conceived and well intended. Time will be the judge to the soundness of their ideas. Meanwhile, there is space for all of us to voice our opinion.